♦ Some Prismacolor Col-Erase® Colored Pencils, the come in box sets and loose individuals, I recommend at last 6, a set of two blue, two orange or green, and two red. A couple black as well are a good idea. ♦ A good pencil sharpener or exacto knife/box cutter to sharpen them with! One that does not break your tips. Try them at the shop. Some of the best for cheep are the small metal models. ♦ Erasers; One kneadable & One white plastic. You will want both! ♦3-4 18”x24” Cartridge paper pads! – you can use newsprint but only if it’s smooth, not the rough kind. Really you will get far better results from white Cartridge paper pads! Again, smooth here makes a difference. ♦ One Large [9”x12” or larger] sketchbook, or pad of SMOOTH paper. Not a “sketch” pad, something like fine marker paper is much better. And one small pocket or purse sized sketchbook for sketching while out and about. Again, Smooth paper is important! Montreal can be a frustrating town to source some things in, but I’ve investigated a few stores locally, and included a list of shops at the end here I think I can recommend, but I can’t guarantee things will be in stock. Call ahead before you go to the shops to see what they have. ♦ Some Prismacolor Col-Erase® Colored Pencils, Sold as singles at the DeSerres as well as in sets, so you can pick your own colours. I suggest light blue [not the non-repro blue though, TOO LIGHT], red, green, and orange! But they don’t cost much and the more the merrier. ♦ A thick wood pencil like a carpenter’s pencil, or solid graphite crayon, block, or pencil, for life sketching. ♦ Dark blue or black BEROL Prismacolor pencils. For fast gesture work, gives a rich varied line. Not to be confused with the Col-Erase pencils. ♦ 1 0.7mm [or larger lead size] Mechanical Pencils! Drop lead pencil under 0.7mm tends to snap a LOT while doing fast gesture work, so I advice you opt for the larger gauge Mechanical Pencils. & 1 pack of compatible HB leads or softer for the Mechanical Pencils! ♦ A good sharpener! I’m a fan of the Palomino-KUM Long Point Pencil Sharpener. There are many kinds, advise trying it out in the store before buying, look for smooth feeling as it cuts the wood. Smooth = sharp, less likely to break your leds. Cheap sharpeners feel rough, they grind the wood and lead more and snap the led by torquing it. ♦ Optional: A set of coloured ballpoint pens. ♦ Optional but recommended: A Pentel Pocket Brush [+refills]. You WILL love this! Some other kinds of Pocket bushes are acceptable, but make sure they have synthetic HAIR tips, not FELT or RUBBER! FYI DeSerres DOES stock these, but they don’t keep them with the regular pens and the pen dept people are typically oblivious to this. Ask for them in the calligraphy section instead by name! Other brush pen options are Pentel Standard Brush Pen, Pentel Pigment Ink Brush Pen, Kuretake Zig Cartoonist Brush Pen, and Kuretake No. 8 Fountain Brush Pen. Possibly the cheapest option i’ve seen is the Akashiya Fude Brush Pens. Learn more about this class of pens here! These are NOT felt tip brush pens. ♦ Optional: Some form of “Water Brush”, my favorites are the Pentel Aquash™ Water Brush, this art co-op stocks them. But Koi water brushes with reservoirs from SAKURA work too and there are several other models. These are for use for watercolor and ink wash work. They are not used interchangeably with ink filled brush pens though! Learn more about this class of pens here! ♦ Optional: A smaller utility knife [example] or xacto style knife. Handy tool generally and good for custom sharpening your pencils. Corrections! making changes and fixing stuff tools! ♦ A Pentel Presto! Pocket Correction Pen. They can be had at many art stores and most office supply shops. I’ve picked up Prestos at De Serres and Staples. And saw bins full of them at Librairie Jasmin co-op UQAM! Bic makes something like them, and there are other correction pens but none as good. Ask for those before going with the Bics. And this is NOT correction Tape! Do not get Correction Tape. These can both be used for crude drawing in white, and corrections. Extremely handy. I tend to buy two or three at a time myself. ♦ Optional: Daler Rowney, Luma Bleed Proof White or Dr. Ph. Martin’s Bleed Proof White-Opaque paint for watercolour. I’ve been doing some comparison testing and there are other options out there, but as white graphic artists correctional paint goes, those two brands I find to be the best. We will use a lot, you’ll want to make sure you stock up. The paper you use for dynamic studies can be cheep, but it needs to be decent, and most importantly smooth paper! Here’s my recommended list. ♦ Optional: A pad of mixed media paper or watercolour paper, something designed to be used with wet media as well as dry. You can buy them in large loose sheets or in a pad. I really like Fabriano Accademia and Mixed Media paper. We don’t use a lot of wet media in the class, but it’s an option so to investigate this option get a little to try it out! Where to get it all!?? A great MTL art coop is La Cohop Saint-Laurent des Arts. They have some great prices and stock nearly everything on my list here and then some, Including the Pentel Water Brushes I love the most and both the Pentel Pocket Brush and Art Brush pens. This is a art store you really want to get to know. Prices with a membership are very competitive with all other shops in town. I use Jetpens for links in several places, for some of the options they are one of the few really reliable suppliers but can take a while to deliver, a month is normal. Local art store options include DeSerres all over town, and a few others. But I always recomend to call ahead or check their sites before heading out, to see who has what in stock where? La Boutique des ARTS de la Coop UQAM is pretty good, and a one time membership feel means their prices are a tad cheaper than DeSerres generally after. And around the corner from it in the same building, is Librairie Jasmin co-op UQAM! Great for things like the Gell Pens and Presto Correction Pens. Brush pens and nice sketchbooks can also be found usually at Au Papier Japonais, and Nota Bene Papeterie has some very nice sketchbooks and a great selection of pens! Encadrements Des Cèdres is not bad but has a limited selection. I hear Avenue Des Arts in Westmount can be good, Kama Pigment for pencils and paints and a small drawing supply section, and if you’re a student at concordia they have a decent Art Supply Store worth checking out too. Again I suggest calling ahead for all of these to see who has the things you need before visiting them, saves time. 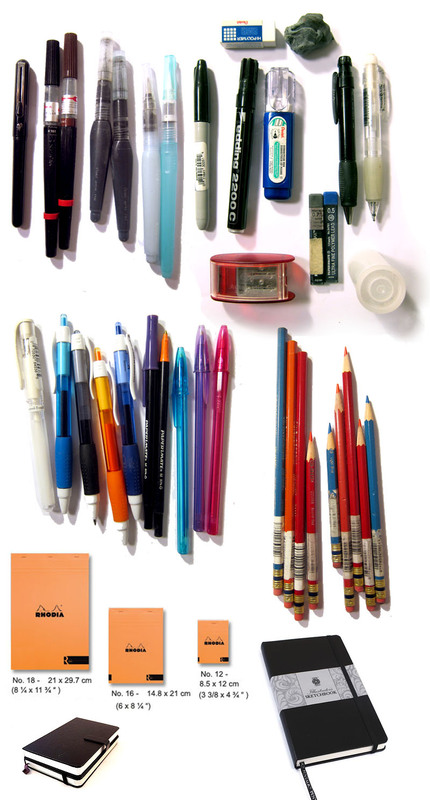 Also several of the items, like gel pens, mechanical pencils and correction pens, can be sourced at places like Staples! This, is a photo of my own tools with most of the things listed. As for the Pentel Aquash brush, I guess any kind of water brush will do? They don’t have the Pentel one at Omer Desseres but I was shown another brand. Waited for first class to confirm our guess was right before buying. The item was located next to small paint rollers at the Omer on Taschereau. this totally felt like a treasure hunt btw! For those, a water colour pencil of some kind, the kind that are water-soluble. Were they out? I’m going to the shop today to pick up a few things, i’ll look to see. Ok, was just there. The Faber Castell Graphite Aquarelle pencils are hard to find, they are with the paints on the other side of the main isle, and at the far end. The have some loose pencils in plastic jugs, though they are running out of those. And there are some packs of sets. If you can grab some those are by far the best watercolor pencils there are. But if you can’t get those any black or very dark water colour pencil will suffice for our class. None of the supplies on the list are impossible to substitute for different brands, just what i found that matched the things i find useful.